Home › Electronics › Greenguard Ultrasonic Pest Repeller (2-Pack) Optimal Pest Repeller For Mice M..
Greenguard Ultrasonic Pest Repeller (2-Pack) Optimal Pest Repeller For Mice M.. CUTTING EDGE HIGH DENSITY ULTRASONIC FREQUENCIES are inaudible sound-waves that will not only show pests the way out of your home, but it will also prevent new entries! Guaranteed to repel mice, mosquitoes, flies, cockroaches, ants, spiders and all other insects and rodents. ECO-FRIENDLY & POCKET-FRIENDLY: Stop spending money on Pest Control Companies that flood your house with hazardous chemicals. GreenGuard is the safest and most effective solution that is guaranteed not harm you, your children or pets. 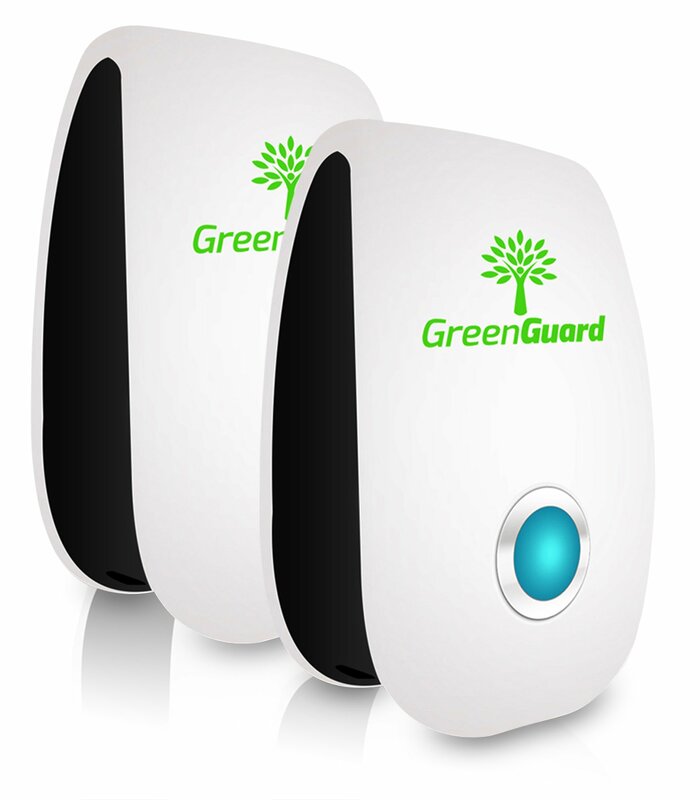 HASSLE-FREE: Just plug in GreenGuard's compact sleek device and it will work its wonders 24/7! CRUELTY-FREE: Unlike glue traps or mousetraps, GreenGuard doesn't kill any pests; it just repels them. LIFE TIME SATISFACTION GUARANTEED - We are so confident that you'll see results within 3-4 weeks that every order is backed by a 100% life time, no questions asked, guarantee. Purchase with total, risk-free confidence. It's time to keep pests, bugs, rodents and creepy crawlies outside where they belong with total home bug repellant protection from GreenGuard. Bugs and mice are sneaky creatures. It seems that no matter how sticky yourwell-placed traps might be, they still find their way into your kitchen,bathrooms and bedrooms. And because you don't want to put hazardous chemicalsall throughout your house-especially if you have pets or children-you need abetter, more effective solution. That's why you need GreenGuard Ultrasonic Pest Control technology designedto emit ultrasonic waves that penetrate walls, ceilings and furniture to driveout ants, spiders, cockroaches, mice, mosquitos and more, before they everreach the inside. Total Home Barrier Each order comes with two total devices that cover up to 2,400 sq. ft. of yourhome. In fact, our ecofriendly solution is safe for pets, children, and eveninsects because it doesn't contain DEET, sprays, sticky traps, poisons oranything else that could cause harm. Simply plug it in and enjoy 24/7, year-round protection from flying, crawling and creeping bugs and rodents. Product Details: Two (2) Pack of Ultrasonic Pest Repellers Standard Wall Plug-In Repels Mosquitos, Spiders, Cockroaches, Mice, Ants and More Emits Ecofriendly Ultrasonic Waves Child, Family, Pet and Insect Safe Indoor Use Only (Year-Round Protection) Coverage: 1,200 sq. ft. per Device (2,400 sq. ft. total) Satisfaction Guarantee Click "Add to Cart" now and start fending off bugs, rodents and spiders before they ever reach your home with ultrasonic, ecofriendly pest repellant!